The design for the Victoria Park Pavilion is informed by two distinct understandings of the pavilion building typology: A park pavilion is often a free standing structure dedicated to relaxation and pleasure. A sports pavilion is dedicated to the participation and observation of sport activity. 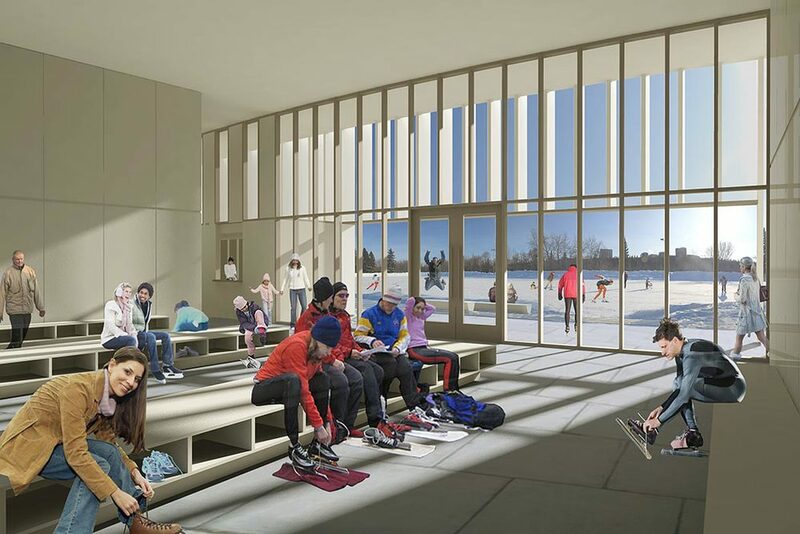 This project recognizes that as the seasons transition to and from winter, the Pavilion, too, will transition between the recreational passive park use and civic activity of a park pavilion, to the active participatory use of a sports pavilion. The design proposes to extend the geometry of the oval so that a park and a sports pavilion become inextricably intertwined within the seasonal changes of use and landscape. The OVAL - stands of mature trees and meadows of spring, summer, and fall exhibit varied definitions of edge. In winter, however, these finer scaled layers of the landscape are veiled by a blanket of snow and replaced with the clear figure of the skating oval. The design seeks to intertwine the oval and the Pavilion through a radial organization that gathers activities and defines movement within the pavilion as an extension of movement on the ice. In this way the Pavilion and the oval become one. In spring, summer, and fall the memory of the ice is embedded in the structural organization of the Pavilion and the form of the landscape situated between the Pavilion and the meadow. Terraces that step toward the meadow provide space for art objects, picnics, concerts, gatherings, and viewing. The PUBLIC HALL - like the central hall of a train station, the Pavilion is organized around a large, singular public space that is shared by all visitors and staff for access and use. It is the space of interaction. In winter this space becomes the skate changing hall and building entry for skiers, snowshoers, the general public, and the Edmonton Speed Skating Association. In summer this space becomes an extension of the adjacent active landscape. It is a gathering space; a sheltered destination for a picnic in the park, a bike ride, an outdoor movie, a game of cricket, a stroll, a class, or a meeting. This main space provides the greatest visual connection between the activity of the pavilion and the activity of the site. At night it glows like a lantern through a screen of wooden frames. The FRAMES - one hundred and seventy 80mm x 494mm glulams stand on end and define the long edges of the Pavilion. 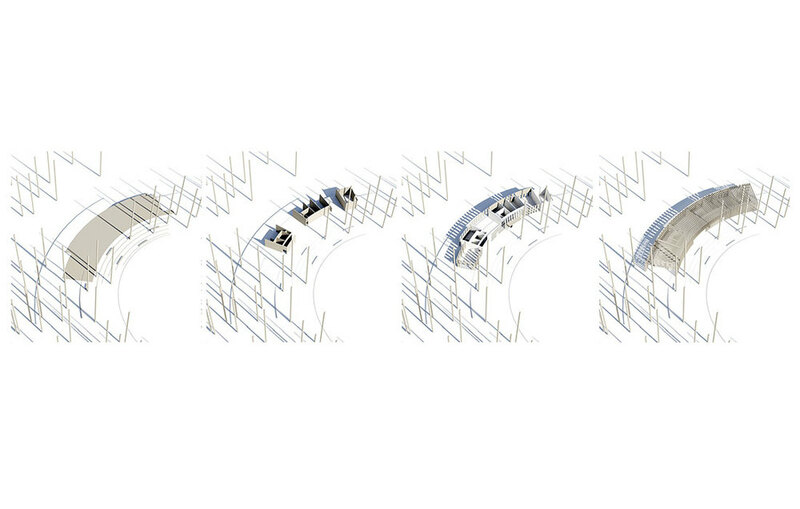 As a collection of elemental structural members they establish a legible singularity of purpose for the building. Through these repeated and iconic structural elements the Pavilion manifests a strong presence despite its modest size. When the frames stand free they provide exterior space to occupy; to play hide and seek or to stand and take in the park. They define a permeable colonnade that provides shade, sheltered building access, and a covered place to park bikes or wax skis. The depth of the frame creates an interstitial space that is inherently flexible and allows for highly specific program responses through variations in building enclosure placement and infill materials. Through this depth of structure the pavilion is no longer defined by a conventional exterior wall, but a permeable, and functional thickness. Repetition of the Frame allows for ease in phasing over longer time periods as new uses are met. Repetition along a curve also provides for variation in view. Like moving through a stand of trees, the frames establish a rhythm for a changing and varied experience of the oval, landscape, activity, and light.